What an outdoors-y summer it has been! There has been no excuse at all not to get out and enjoy the weather … and our local sports facilities are certainly benefiting. If you want proof of just how well-regarded our local sport is in the rest of the region, look no further than the latest crop of awards. At the Staffordshire Moorlands 2018 Sports Awards, around half of the accolades went to folk based here in this village! Sports Team of the Year went to Blythe Cricket Club’s 1st XI, who won the NSSCL First Division title with more wins in a season than any in the league’s history. The Sport Across Staffordshire (SAS) Volunteer of the Year was Angie Heathcote, who has been the managing hand in Blythe Cricket Club’s financial success. And Sports Coach of the Year went to Tara Burndred of the Tatsu Dojo Club in Cresswell. Meanwhile congratulations are also in order to Mike Heath at Draycott Tennis Centre; he won the ‘Tennis Staffordshire’ Volunteer of the Year Award (which is part of the national British Tennis Awards). But it doesn’t stop there. Not only are our people among the best, so are the facilities. As we all know ‘Draycott Racquet & Fitness Club’ – to give it its full title – offers tennis, indoor-tennis, squash, badminton, and gym. Classes on site include spinning. In the last few years, they’ve refurbished the gym and squash areas but now they’re pushing on further – by investing over £20,000 into new equipment. Yes, on their way (as we speak) are eight new Impulse Machines, two New Star Trac Treadmills and additional free-weights. Lockers will also be installed. Work is ongoing, but should be finished by the end of this month. Why not go along and check it out then for yourself? Surely it’s that forward-looking attitude that has helped the club to produce its first world-ranked tennis player – Elliott Farmer . Elliott achieved his world ranking in doubles earlier this year when he competed in the Tunisia F18 Doubles – reaching the semi-finals, which means he is now world-ranked. Congrats to him! Elliott has been training for over 10 years now at Draycott (with his main coach here being Craig Leese). He is now also constantly travelling the world trying to achieve a world ranking in singles too. (Fortunately he has great sponsors – including the South Cheshire-based ABC Solutions company). So… Draycott – a great place for high-class tennis. And if you want to see some matches (almost as good as Wimbledon ! ), and see them for free, head down to the three-day long annual Draycott Open Tournament, which starts on August 5th. Now, everyone pretty much knows the success story that has been the Cresswell-based Blythe Cricket Club over the past two years. Not only did the club successfully bid for (and build) a new pavilion, costing some half-million pounds, but the first team achieved promotion to the NSSCL Premier Division in 2017, and this season are even challenging strongly for the championship. But, again, success is built on great volunteers and by improving facilities. The most recent improvement has been the new nets, which replace the rather outdated old ones. Not mentioned as often as it should be is the fact also that the club runs youngsters’ teams, with even an under-8’s team on the roster. There has been no women’s team since the last one folded in 2014, but (we’re told) the club has not stopped looking for a way to re-start it. 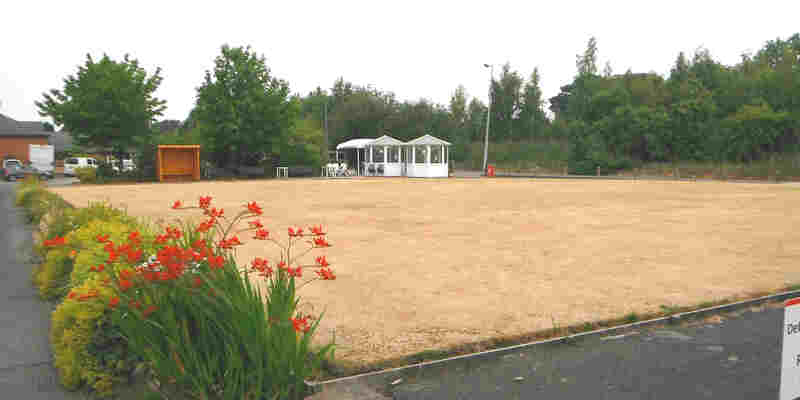 However, one club that has had a slightly more difficult year than other local ones is the CP Outdoor Bowls Club, which is based on Blythe Business Park in Cresswell. A major distraction has been the future of the business park itself, which will be transformed over the next year with the development of extra infrastructure and industrial units & factories. However, it does now look as though the bowling green is safe; and the club will continue. But long-time secretary Sue Stepek is stressing the advantages of playing this beautiful game to all who are thinking of an outdoor pursuit. But, when you think about all that’s here… then, how lucky are we???? This entry was posted in sport, volunteering and tagged Blythe Cricket Club, Checkley Bowls Club, draycott sports centre, Staffordshire Moorlands Sports Awards, tara burndred, Tatsu Kai Dojo Centre. Bookmark the permalink.